With the recent success of their inaugural product, the Ghoul Screamer, guitar legend Kirk Hammett's KHDK Electronics is now ready to unleash the No. 1 Overdrive, an original tube-like overdrive pedal. The No. 1 Overdrive is a powerful, character-defining pedal that boasts a KHDK original circuit based on a radical blend of op-amp and mosfet technology. Available now to the public globally, the No. 1 Overdrive is already in use by some of the hard rock and metal worlds' biggest stars including Kirk Hammett himself, DISTURBED's Dan Donegan, Rob Zombie's John 5, GOJIRA's Joe Duplantier, VOLBEAT's Rob Caggiano and HELLYEAH's Tom Maxwell. Of the No. 1 Overdrive, Kirk Hammett commented, "No one has done anything like our No. 1 Overdrive pedal before. It's so unique and so god-damned good." KHDK co-founder David Karon added, "The response we've had is just overwhelming. We knew we had something special on our hands with the No. 1's circuit and the incredible feedback we've been getting from guitar nerds worldwide is a validation of just how badly this was needed. At KHDK we don't shy away from paying homage to existing pedals that have been loved by generations of guitarists, but our focus is on taking new risks and pushing the envelope by creating original circuits to take guitar tones to a new level." Constructed with feedback from Kirk Hammett, DISTURBED's Dan Donegan and world-renowned producer Tue Madsen (THE HAUNTED, HATESPHERE, SICK OF IT ALL), the No. 1 Overdrivefeatures two gain controls which cascade the gain stages for a rich and harmonic overdrive. Gain one controls the first gain stage from a pure clean boost to a naturally compressing overdrive. Gain two shares one knob with the Bass control. It cleverly controls the gain and the low end of the next stage gain, which adds rich harmonics, bottom end and natural tube-like saturation to your tone. It is designed as an active high-pass filter for the second gain stage and will allow you to set the amount of bottom end with precision. The pedal has a powerful, dynamic character and is pick-sensitive and highly responsive. Like all KHDK products, the No. 1 is hand-built by a family-run manufacturer in Paducah, Kentucky. KHDK's inaugural product, the Ghoul Screamer guitar pedal, was conceived by guitar legend Kirk Hammett and designed by KHDK laboratories. The Ghoul Screamer is the perfect multipurpose guitar pedal, designed for the true guitar gearhead, possessing dramatic versatility with controls spanning from a clean boost all the way to a massive overdrive. In addition to the three standard controls (drive, tone and volume), five more switches have been added to the Ghoul Screamer to greatly expand the sound palette - bass switch, high switch, body switch, compression switches and foot switch. 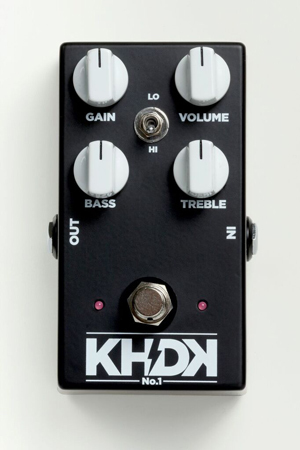 Founded by legendary METALLICA guitarist Kirk Hammett and industry vet David Karon, KHDK Electronics is a new boutique guitar effects maker. Working with world renowned musicians to develop their products, KHDK stands for an exclusive lifestyle brand which caters to artists who are not afraid to push the envelope. Over the past few years, KHDK has relentlessly refined and polished their vision with pain-staking detail. From conception to prototype each product has been carefully crafted by engineer Antonin Salva. KHDK co-founder Kirk Hammett needs no introduction. As lead guitarist for METALLICA for more than three decades, Hammett has sold hundreds of millions of albums, toured the world many times over and has been awarded multiple Grammy Awards and is regularly listed as one of the greatest rock guitarists of all time. KHDK co-founder David Karon has had decades of experience creating iconic products for the biggest names in music. With KHDK, he gives artists an independent platform for turning their creative visions into reality and delivering the highest class of stage and audio gear.